If you’re in need of a new roof, you want to choose the best roof shingles for your home. There are several important factors you should consider when deciding which type to use. The variety of roofing services you’ll need can depend on many things, including the style and structure of your house, your climate, and your budget. We’ve put together an excellent guide to help you pick the best roof shingles for your home. Read on to learn more. Asphalt shingles are the least expensive and most commonly used shingles. These shingles are made of waste paper materials that have been saturated in waterproofing asphalt and embedded with ceramic granules. Asphalt shingles come in a thinner, less expensive three-tab style, a laminated style, and a more costly architectural style. While these are more budget-friendly, they do have a shorter lifespan than other shingle types. A roof with asphalt shingles usually lasts between 20 and 30 years. Tile shingles are made of durable clay and can last up to 50 years. They’re great for more extreme temperatures, both hot and cold. They’re also more resistant to wind damage than asphalt. Tile shingles are significantly more expensive than asphalt, usually around double the price. These shingles look great for a variety of house styles. They’re frequently used on Southwestern and villa-style homes. Weight is a factor when deciding if a tile is best for your home. Tile shingles are very heavy, so it’s important to find out if the structure of your house can carry the weight of this roof type. Wood shingles are made of cypress, red cedar, redwood, and pine. These are more expensive but more durable and resistant to roof damage than asphalt shingles. They can last from 30 to 50 years. 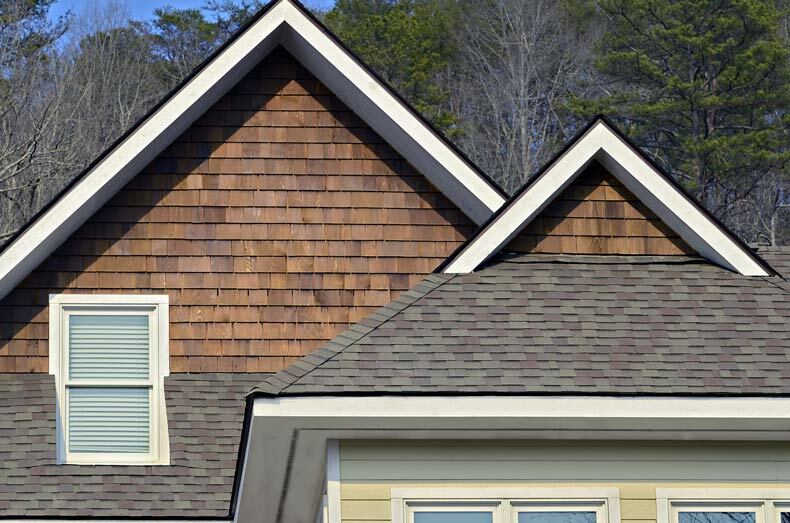 Wood shingles are aesthetically pleasing and give your roof a more natural, organic look. They also insulate your home more than asphalt and can withstand severe weather conditions and high winds quite well. While they are durable, wood shingles do have a few downsides to keep in mind. Because they are made of dry wood, they are less fire resistant than other shingle types. Some states consider them a fire hazard. Wood-damaging insects such as termites and wood borers can also be problematic with wood shingles if proper preventative measures aren’t taken. Wood shingles should be treated with stain, varnish, or paint to deter pests. This also helps prevent rotting, warping, and cracking. Slate shingles are made of natural stone. They’re an expensive but incredibly durable shingle type that can have a lifespan of 50 to 100 years. They’re especially good choices for areas with frigid winter temperatures because of their resistance to damage caused by water and extreme cold. Repairs and maintenance for slate roofs can be pricey. They’re also heavy. Like tile shingles, you’ll need to make sure your home’s roof structure can handle the weight of slate shingles. There are synthetic slate shingles that are much lighter. They’re made to replicate the look of slate. While they’ve got the visual appeal of slate, they’re less durable. When choosing a roof, spend some time deciding what look you’re trying to achieve, how long you’d like your roof to last, and how much money you can contribute. If you’re in the Calgary, Alberta area and you need a roof upgrade, contact us. You can ask for more information and prices or arrange for a consultation. If you’d like more helpful information on roofing and other home maintenance and upgrades, feel free to explore our other blog posts.